Gesa Kordes performs with numerous chamber ensembles and Baroque orchestras on both sides of the Atlantic, including Music City Baroque, Muses’ Delight, Opera Lafayette, Ensemble Tra i Tempi, Harmonie Universelle, Churpfälzische Hofcapelle Mainz, and Rheinisches Barockorchester Bonn, as well as the Atlanta Baroque Orchestra. She has toured as soloist and chamber musician in the U.S., Central America, Europe, and Israel and has recorded for NPR, harmonia mundi, FONO, Centaur, Dorian, and Naxos. 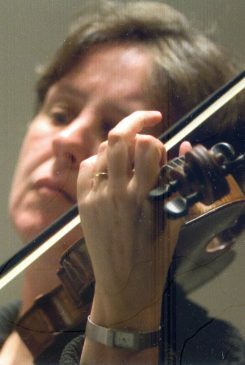 Since 1998, Ms. Kordes has been increasingly in demand as an ensemble director of chamber groups and Baroque and Classical orchestras in the U.S. and Europe, most recently at the Victoria Bach Festival in Victoria, TX, Troisdorf Barock in Troisdorf, Germany, and the Staunton Music Festival in Staunton, VA.
Ms. Kordes received her Baroque and Classical violin training from Stanley Ritchie and John Holloway at Indiana University’s Early Music Institute, where she served as Lecturer for Baroque violin. She holds a double master’s degree in violin and musicology from Indiana University, where she was admitted to candidacy for a Ph.D. in musicology. As a musicologist, she has presented papers and lecture-demonstrations at conferences in the U.S., Canada, and France and published articles on topics ranging from Bach cantatas to serialism. After teaching at Indiana University’s Early Music Institute and the University of North Carolina at Greensboro, Ms. Kordes joined the faculty of the University of Alabama in 2009 as Instructor of Early Music Performance.